Complete the puzzle, then play the game! In 1889, Elizabeth Cochrane (American, 1864–1922), a twenty-five-year-old journalist who wrote under the pseudonym Nellie Bly, set sail from New York in an attempt to circumnavigate the globe in fewer than eighty days—thus breaking the record of Jules Verne’s fictional character Phileas Fogg. Traveling by ship, train, rickshaw, sampan, horse, camel, and burro, she returned to a cheering crowd in under seventy-three days. Bly’s stories about the people and lands she encountered en route were published in The New York World. Touted as the most famous woman on Earth as a result of this adventure, Nellie Bly was an inspiration to women during an era when marriage or a menial job was considered their only appropriate option. 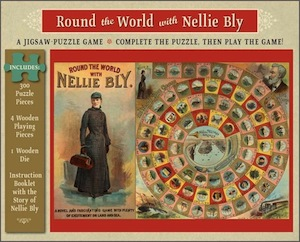 The game Round the World with Nellie Bly was first published in 1890. The original artwork for the game—held in the Liman Collection of American Board and Table Games at the New-York Historical Society—is reproduced on this 300-piece jigsaw puzzle. Also included in the box are four wooden playing pieces, one wooden die, and a booklet containing play instructions and more information about the game’s heroine. Puzzle size: 24 x 18"